Regional Waste CQ fulfils a vital role in the local towns and cities of central Queensland such as Duaringa, Dingo, Bluff, Blackwater, Emerald, Moranbah, Rockhampton, Yeppoon and everywhere in between. Not only that, waste is collected from a wide range of locations, including various shopping centres, mine sites, camp sites, building sites and properties. Waste management is a diverse and growing business with a continued emphasis on safer operation. It’s this focus on safety that led Regional Waste CQ Managing Director Leigh Williams to invest in a new Palfinger Hookloader fitted to an Isuzu 8×4 truck. To make it happen, Leigh reached out to his local Palfinger sub dealer, Mick Butler, at DC Equipment Sales in Townsville. DC Equipment Sales is a company that aims to provide quality, long-lasting machinery and equipment which enables its clients to maximise efficiencies. While Regional Waste CQ has some smaller 6×4 Hookloaders in its fleet, Mick readily identified that a larger Palfinger T22A Hookloader mounted on an 8×4 truck would be the best solution for the company’s needs. DC Equipment Sales and Gough Palfinger Australia collaborated to create a functional and stylish design that offers a high degree of safety while maximising waste collection efficiency. Gough Palfinger Australia has a 38-strong network of service partners and sub dealer agents throughout Australia, working to make sourcing and selecting waste equipment and vehicle loading cranes easy for local businesses. Mark Gardner, Marketing and Business Development Manager at Palfinger Australia, says the benefits of having a comprehensive sub agent and service partner network means businesses are never far from local servicing, support or spare parts. “In the waste industry, hours and even minutes count, downtime equals lost revenue and a potential loss of business. Many waste operators double shift their hookloaders with some units working 24-7. If a hookloader unit was to break down without local support, it could result in a damage of reputation or there could be a loss of business,” Mark says. The 5975-millimetre-long T22A Palfinger Hookloader and the 5975 millimetre-long T22A DINO Palfinger Hookloader are the most popular models in the line-up and the ideal size for a range of 8×4 trucks. Both units are readily available and supplied from Brisbane meaning they can be ready to be fitted within weeks. While the T22A units have a safe working load limit of 22 tonnes, the average usable payload is between 13 and 15 tonnes, depending upon truck selection and fitout. The Palfinger T22A and T22A DINO units come standard with an articulated arm allowing for transport of shorter containers and flexibility in loading and unloading. 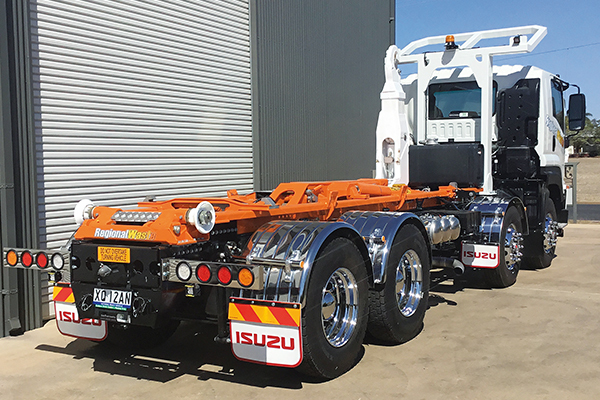 Gough Palfinger Australia supplies mounting kits specifically designed to fit each brand of truck, making the fitting process fast and easy and ensuring durability and reliability. Mark explains that buying a hookloader is not just about selecting the right model, it’s also about ensuring the truck fit-out and setup meets the day-to-day requirements of the customer. For this reason, he says, Palfinger and their service partners offer a wide range of additional fit-out options and equipment. One of the most commonly selected options is a tarping system, which allows companies to safely cover bins while in transit. Another feature that is available is a four-camera system with a microphone, allowing safer operation on busy sites. “Things like tarping systems, front bin locking, toolboxes, hand washing units, working lights, camera systems, scales and tow hitches are some of the optional extras available to meet our clients’ needs,” Mark says. With its hookloaders, Palfinger offers three main designs. The telescopic range is available from three to 30 tonnes. Additionally, the Australian-designed T22A DINO unit offers internal and external rear container locking, complemented with zero tunnel clearance for the older cable truck containers while maintaining the abilities of the telescopic range. Gough Palfinger Australia also offers the G30 triaxle trailer-mounted Hookloader for heavy-duty work with a prime mover, often used by waste transfer stations.